The Luxury Market segment is the descriptive term reserved for Teton Counties finest, and correspondingly most expensive properties. In 2015, over 29 single-family homes sold with prices greater than $4,000,000. Examining this data in greater detail , it was further learned that 2015 saw 11 sales of $9M or greater, which totaled over $122M in dollar volume of sales. 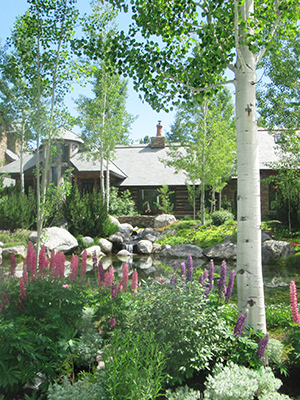 At the risk of stating the obvious, the most basic attributes that define a luxury home in Teton County are the home’s location and its quality of construction. 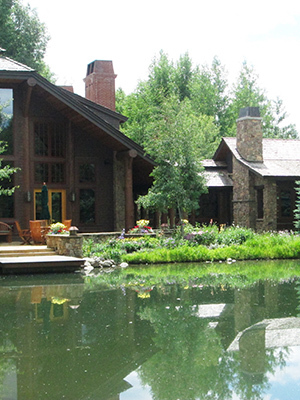 Quality – A luxury home in Jackson Hole will be built with no expense spared. To some this may imply the use of large diameter logs and reclaimed timber beams with wrought iron accents, to others this may mean architectural concrete and floor to ceiling glass with a minimalist flair. 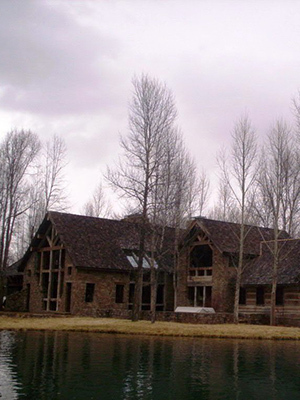 Regardless of your taste, Teton County’s construction force is a proven entity when it comes to producing homes of matchless quality and detail. Location – There is no one location in Teton County in which a property must be located in order to be considered as a luxury property. 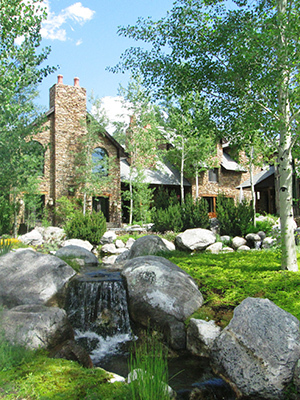 Luxury buyers may have a desire to be close to the ski slopes as a priority or may want seclusion and their own trout stream – the locations to satisfy both of these preferences exist in Teton County. 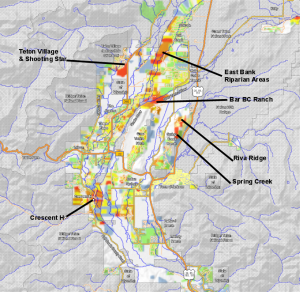 As examples, the recently developed Shooting Star Golf Course provides the opportunity for resort living at the base of the Jackson Hole Mountain Resort, while the east bank of the Snake River from its intersection with the Gros Ventre River and northward is a setting providing larger (35 acre+) homesites for secluded ranchette properties in such developments as Bar BC, Bar B Bar and Riva Ridge. Water Frontage – Being perhaps a subcategory of location, water frontage can significantly increase the value of a home and can up to double the value of a vacant site. The view and fishing amenity provided by the Snake River or Gros Ventre River, as well as any of the named and unnamed spring creeks that traverse the valley is a must have attribute for some market participants. Teton Views – As the center piece of Grand Teton National Park, the granite spires of the Teton Range are arguably one of the most treasured views in the western United States. Many luxury homes have been sited specifically to maximize the benefit of such a view. Proximity to Public or Protected Lands –Less than 3% of Teton County is available for development, with the balance being a mix of National Forest, Wilderness, National Elk Refuge, BLM or conservation-easement-protected land. Proximity of a home to public land can provide protected view corridors and direct contiguity or a beneficial easement can provide private access to a boundless recreational opportunities. The existence of one of the above attributes can create a home of considerable value. The existence of more than one of the above attributes can enhance value exponentially. The sales prices of the Luxury segment of the market ranged in 2015 from its bottom demarcation value of $4,000,000 to over $21,500,000, with an average value for this segment of approximately $7,700,000. Observing the adjacent thematic map of assessed property values in Teton County, this conclusion can be visually corroborated by the concentration of the areas which progress from yellow to red-shaded regions. 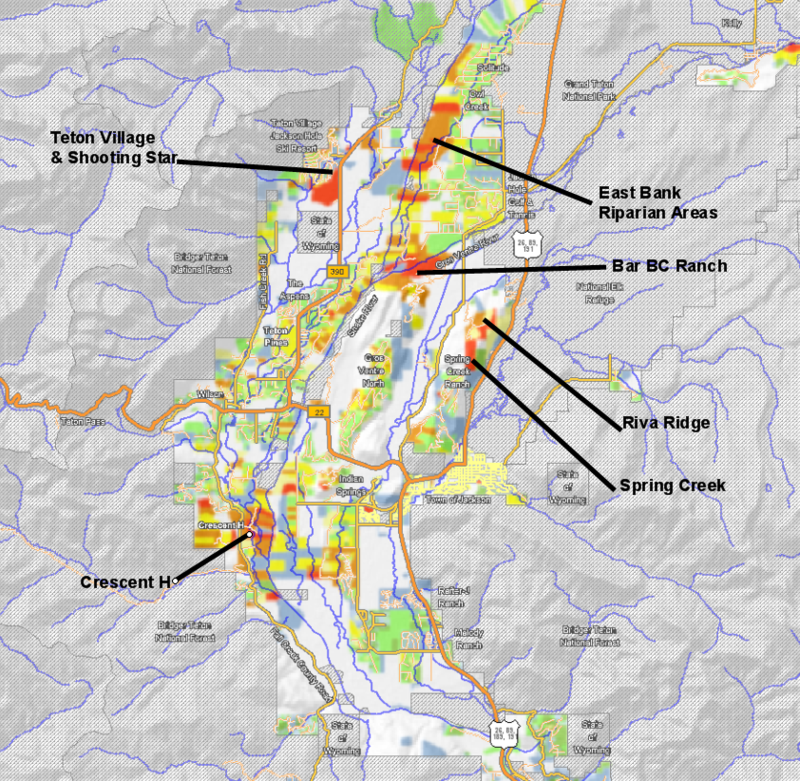 Concentrations of high value property can be noted on the west side of the Snake River in Teton Village (skiing / golf), Teton Pines (golf) and Crescent H (fishing outdoor recreation). 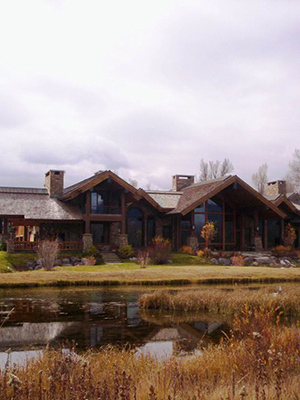 Luxury homes are also noted on the east side of the Snake River from its confluence with the Gros Ventre River at the Bar BC Ranch Subdivision and extending northward following the Snake River towards the boundary with Grand Teton National Park.